June 14 marks the six-month anniversary of the tragic Sandy Hook Elementary School shooting in Newtown, Connecticut. Twenty-six people at the school, including 6 adults and 20 students, were killed. Jennifer Hubbard recalls that her daughter created business cards for an animal shelter. Catherine Violet Hubbard was one of those children. She was only 6-years-old when she died. Catherine would have turned 7 on her birthday, June 8. Little Catherine had one dream in life, and that dream was to devote herself to saving animals in need. But even though Catherine has passed, her family, friends, and thousands of supporters across the country and around the world are making sure her dream lives on. Catherine’s mother, Jennifer Hubbard, remembers her daughter in a poignant op-ed piece that originally appeared in Guideposts; the Huffington Post reprinted Jennifer’s tribute in late May. “It was as if she couldn’t contain her need to care about every living thing,” Catherine’s mother lovingly adds. Catherine, who doted on every animal she met, including her rabbit, Flopsy, and the Hubbards’ late yellow Labrador Retriever mix, Samantha, who suffered from arthritis. “Catherine was always there picking her up,” Catherine’s father, Matt Hubbard tells The Hartford Courant. In lieu of flowers after Catherine’s devastating passing, Jennifer and Matt Hubbard decided to ask for something they knew their daughter would have wanted — donations for a local animal rescue organization in Newtown. Jennifer and Mark selected The Animal Center, a small group of volunteer rescuers, to be the recipient of all donations made in Catherine’s memory. What started out as a simple request to honor their daughter’s life has turned into an outpouring of kindness from complete strangers, kindness that will help the Hubbards and The Animal Center fulfill Catherine’s ultimate wish — to create a place where rescued animals can receive the love and care they need. The money they have raised and that continues to come in will be used to establish the Catherine Violet Hubbard Animal Sanctuary in Newtown. While many different kinds of animals will have a home at the sanctuary — “sheep, goats, cows, all the animals she loved when she was out and about” — there is one animal that Jennifer says must have a special garden at the sanctuary — the butterfly. The Hubbards say their daughter had a unique relationship with butterflies, who would often land on the little girl’s hand. Catherine would even whisper to them before they flew away. “She would send them on their way and always tell us if we’re kind to them they’ll tell their families that I’m kind and come back,” Jennifer remembers. A book auction to raise funds for Catherine’s animal sanctuary, “Authors for Catherine’s Dream,” runs until June 17. Forty books signed and donated by authors like Ann M. Martin, Katherine Erskine, and W. Bruce Cameron are available to the highest bidder, with all proceeds benefitting Catherine’s dream sanctuary. To make a donation to the Catherine Violet Hubbard Animal Sanctuary, please click on the PayPal “donate” link or mail a personal check payable to The Animal Center, P.O. Box 475, Newtown, CT 06470. 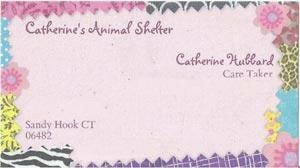 Please write on the memo line that your donation is for the Catherine Violet Hubbard Animal Sanctuary. To stay up-to-date with information on the progress of the sanctuary, visit the Catherine Violet Hubbard Animal Sanctuary Facebook page.